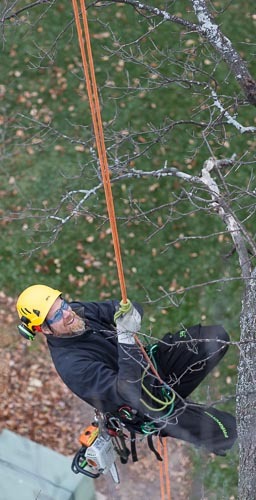 Tree pruning (also called “trimming”) is the most important way property owners can care for a tree over the course of its life. Pruning a young tree gives it a healthy start and maximizes its benefits to your property. Maintaining good pruning practices minimizes storm damages and injury from falling branches. At the end of a tree's life, tree removal is the final pruning. Giving trees early attention and care helps maximize their aesthetic shape, while minimizing your long-term expense. Trees “know how to grow” in a forest, where most sunlight does not reach the forest floor. When you plant trees in an urban setting, however, the overabundance of sunlight relative to a native forest setting encourages trees to grow out (sideways), not up. Train pruning young trees attempts to better simulate natural forest growth through branch management or pruning. Young trees have temporary branches and permanent branches. Keeping the temporary branches small for future removal, establishing a central leader (trunk), and also establishing permanent branching for the future canopy are the main goals of train pruning. Below are is general approach Heartwood takes to ensure your tree has the proper structure to thrive for decades to come. Mature oaks sometimes requires walking WAY out on a limb. Focusing on these principles will minimize future maintenance costs, reduce potential for storm damage, provide the tree with a dominant central trunk, and reduce the need to remove large branches in the future. If you'd like to read more about structural tree pruning and trimming, check out Trees Are Good and the University of Florida's pruning tutorial. Through shrub pruning is essential to maintaining shrub and decorative tree health, while also controlling size. Established plantings provide great visual interest, focal points for your landscape, and privacy from neighboring properties. Oftentimes, property owners remove and replace neglected or overgrown shrubs with another similar shrub that will be overgrown in 10-20 years again. Stop the "feast or famine" cycle by using regular pruning to give the landscape an established look, while also saving you money over the long run. Prevent foundation plantings from becoming overgrown and/or touching buildings. Maintain proper spacing between each plant (excepting hedge situations). Improve the longevity and quantity of flowers in flowering shrubs like lilac, dogwood, and witch hazel. Maintain the health of your privacy screening and control its size. More frequent hedge or screening pruning ensures the screening remains full and thick. Infrequent pruning usually requires removal of more plant material, often leaving small holes or bare spots. Return vitality to old shrubs in rough shape through rejuvenation pruning. Rejuvenation pruning not only improves shrub appearance, it also improves their vigor and health. The growth habits of each particular plant and your own specific needs dictate the pruning actions we take. For an overview of pruning small trees and shrubs, we suggest Purdue University's excellent pruning overview. Climbing fixed ropes using a prussik hitch. We do not use bucket trucks or cherry pickers to prune mature trees; instead, we climb trees using ropes, saddles, and pulleys to do our work. Tree climbing allows much more precision in pruning because we can access every part of the tree (especially the interior), which an aerial lift can not do without breaking sprouts and/or branches. This means we are hand-selecting our cuts specifically for tree health without worrying about access. By climbing your trees, we do not have to bring a big truck into your yard, which can result in dramatic soil compaction. This is Leave No Trace pruning at its best! By using ropes and a ground crew, we can safely remove large branches with minimal damage to other trees, gardens, or turf. Customers may keep any resulting plant debris (for mulching, firewood, carving, etc.) if desired. Fruit trees require special pruning attention to maximize a delicious harvest. Regular pruning helps ensure consistent annual fruit production and maintain the ideal size, shape and structure of the tree. Pruning opens the canopy to light and air circulation to help minimize disease. Tree structure and form can be improved and maintained by proper pruning. This can help protect your tree from branch failure during periods of heavy snow or fruit production. Pruning is scheduled for late winter while trees are still dormant to avoid winter injury from exposed pruning cuts. We sterilize our tools before working and between each tree to prevent the spread of disease. Pruning of edible and ornamental fruit trees should begin the third year after planting. Ornamental fruit trees, such as crab apples, should be pruned every two to three years. Edible fruit trees, such as apple, pear and cherry, should be pruned yearly.